Data inquiry focused on English language learners (ELL students) is driving systemwide improvement in a 25-district network. Leaders gather and analyze evidence to illuminate ELL students’ learning experiences, then shape changes in policies and practices. The process builds capacity and commitment, with ELL success the responsibility of everyone, not just ELL specialists. Educators in a group of school districts in New York State are zeroing in on a major challenge to the academic growth of English language learners (ELL students): Typically only 2 to 3 percent of ELL students’ total class time involves engaging in productive listening, speaking, reading, or writing in English for academic subject matter learning. Equipping district leaders with the tools they need to collect these kinds of data is central to a three-year initiative WestEd has led in collaboration with the New York State Education Department (NYSED) and Stanford University. The goal of the ELL initiative is to build the capacity of district and school leaders to make systemic improvements that boost the achievement of ELL students, better preparing them for college and careers. Funded last year by the Bill and Melinda Gates Foundation, the initiative builds on WestEd’s successful earlier work with individual districts elsewhere. In New York, WestEd and Stanford provide technical assistance to the NYSED and a network of 25 districts throughout the state. According to the NYSED, just over 80 percent of all freshmen who entered New York high schools in 2013 went on to graduate in four years, whereas ELL students in the same cohort fared much worse. The four-year graduation rate for ELL students (which includes relative newcomers and longer-term ELL students) was just 27 percent, even lower than it had been a few years earlier (34 percent). Although many ELL students who fail to graduate in four years do remain in school and eventually earn diplomas, the dropout rate for ELL students is a disconcerting 30 percent in New York. 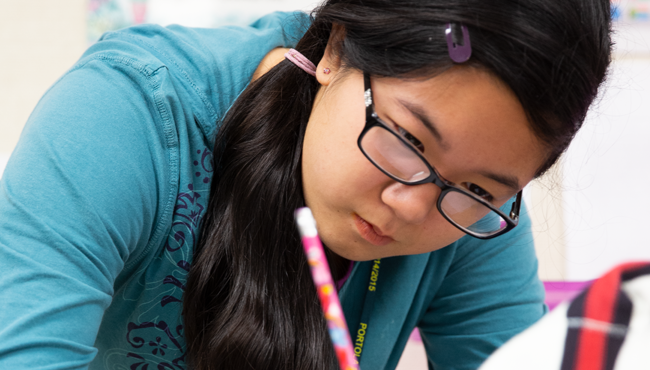 There’s no denying that too often ELL students’ lack of support with advanced academic language and literacy significantly impacts their ability to engage successfully with academic content. Faced with such challenges, education leaders tend to look to ELL teachers and specialists to raise ELL achievement. But New York State’s 25-district initiative treats ELL achievement as a systemwide issue — the responsibility of everyone, not just ELL specialists. Over the 2017/18 school year, three to five leaders from each participating district came together in a networked learning community during three face-to-face institutes designed by WestEd and Stanford. The leaders included assistant superintendents, chief academic officers, budget and curriculum directors, and instructional specialists. During each two-day institute, they worked directly with experts in policy, data analysis, instructional leadership development, systems management, assessment, and pedagogy. Institute sessions focused on strengthening participants’ understanding of quality ELL instruction, teaching participants to use data analysis tools designed to evaluate ELL students’ linguistic and academic development, and generating urgency and commitment to develop plans for improving ELL instructional practices and program leadership. In addition to participating in face-to-face institutes, the leaders also carried out a series of application tasks back in their home districts, such as examining course-taking patterns, analyzing the effects of district policies on ELLs, shadowing students, and carrying out classroom observations focusing on ELL students’ learning experiences. In a series of six interactive, online working sessions, participating leaders reported on their takeaways from the application tasks and had further opportunities to network with peers from other districts. One of the tools that WestEd shared with network participants is a student-shadowing protocol designed to document exactly how ELL students experience the school day. Under the protocol, an educator shadows a student for a three-hour period, regularly recording how many minutes the student engages in academic speaking, listening, writing, or reading in English. Data are also gathered on how much time, if any, students spend interacting in their home language. Such an exercise “paints a quick portrait of students’ qualitative experiences,” says María Santos, engagement director of School and District Services with the CSAP. And, she notes, the data aggregated from the tool often confirm that ELL students “are not afforded opportunities to engage in academic, grade-level practices.” In addition, institute participants learn how to conduct classroom observations focused on students’ opportunities to engage in language and content learning simultaneously, leverage their linguistic and cultural assets, and build autonomy as learners. The data gathered are then analyzed and used to gauge the quality of ELL instruction. 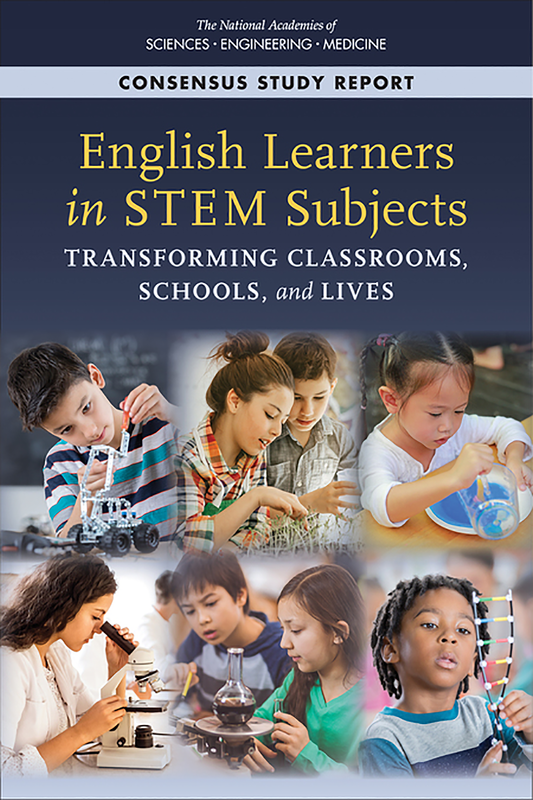 The importance of shifting responsibility for ELL students’ success from the sole purview of ELL teachers to that of virtually everyone working in a school district is one of the key lessons emerging from WestEd’s work, according to Santos and Linquanti. “For example, math or science teachers traditionally might not have thought about integrating language development into their lessons,” says Santos. She describes changing that focus as a “huge mind shift.” Adds Linquanti, “It’s critical to take a systemic approach so that ELL-focused work is not done in isolation and everyone is mutually accountable for shifting policies and practices in ways that transform the system.” That’s one reason initiative participants include not only ELL staffers, but educators from a range of disciplines. Because the initiative involves a network of districts and NYSED leaders, participants have support from the state and from their peers in other districts to help them uncover, analyze, and respond to common problems of policy and practice, and to cultivate leadership around such issues. “Structures are in place so that you can have big conversations and that everything that happens — all the decisions that are made — are made in tandem [with] and in support of deepening the work that has to happen in the classroom,” says Angelica Infante-Green, an NYSED deputy commissioner. Lissette Colon-Collins, an NYSED assistant commissioner, sees the initiative’s networking capacity as a way to develop a “common language among leaders” when it comes to both creating a sustainable language development approach for ELL instruction and building future leadership capacity. District leaders say they value opportunities to use protocols that help uncover challenges and root causes, to share data on practices and outcomes, and to collaboratively prioritize and enact strategic improvements. The data help shape conversations and guide the districts’ work to identify and begin to address the diverse strengths and needs of ELL students and their educators. The initiative has sparked considerable interest. After the Council of Chief State School Officers (CCSSO) invited WestEd and New York State to present their learnings to date at a CCSSO event last year, another 25 states formally expressed interest in starting initiatives similar to what the New York districts have undertaken. A cross-state network focused on building state-level leadership for district ELL improvements is now underway. Other evidence of the initiative’s impact, particularly in its systemwide focus, can be found in changes to several New York state policies and practices, including recognizing more native-language content assessments in graduation requirements, calculating five- and six-year ELL graduation rates, and prioritizing district improvement plans to address dropout prevention. At the local level, the initiative’s districts are paying more attention to boosting attendance for ELL students and improving their access to college-prep coursework and timely, responsive counseling. Linquanti describes ELL-focused work as “a contrast dye that helps illuminate the strengths and weaknesses of the entire system. What is effective with ELL students is likely to be effective for all students.” He and Santos are encouraged that district leaders participating in the initiative have embraced the challenge of taking a system-level look at their instructional and administrative practices, using both quantitative and qualitative data, with an eye toward improving teaching and learning across the board. “It’s a coherent, interlocking approach grounded in key principles of effective ELL instruction,” says Linquanti. 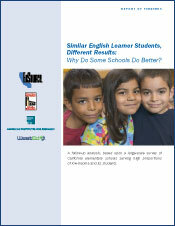 Similar English Learner Students, Different Results: Why Do Some Schools Do Better? Fostering Academic Success for English Language Learners: What Do We Know? 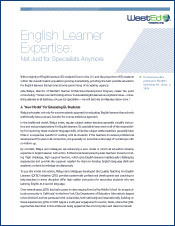 This publication synthesizes information from several authoritative sources in order to foster better educational practice and accountability for the success of English language learners. 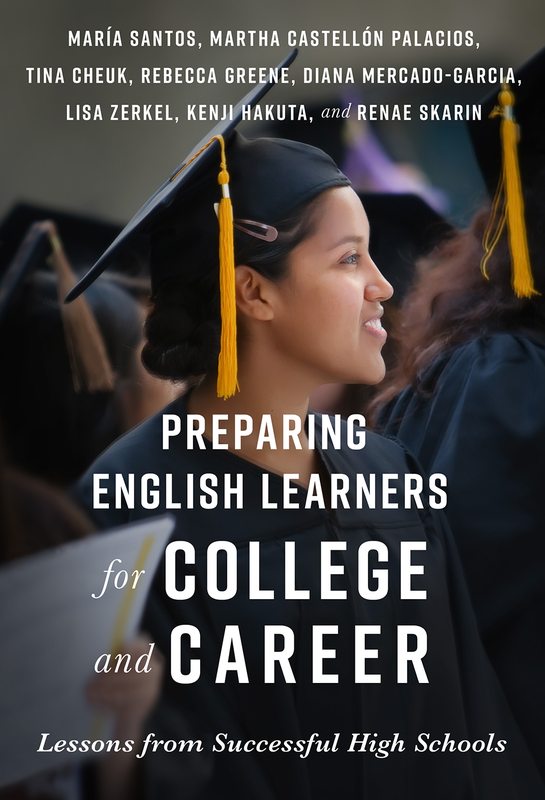 This book profiles six high-performing high schools that had a singular focus on improving the educational outcomes of English learners. 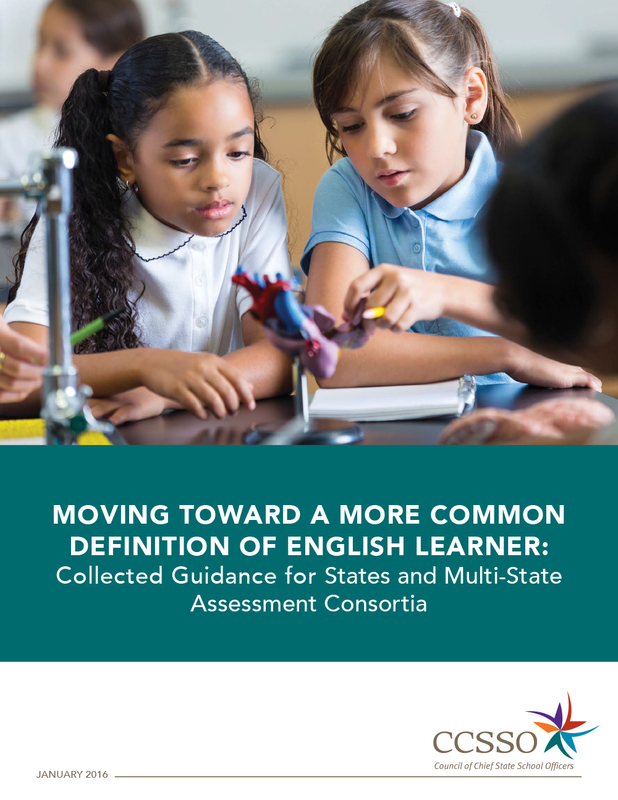 This resource gathers four guidance papers designed to help individual states and multi-state assessment consortia move toward a more common definition of English learner.